Southern Airways,Inc. 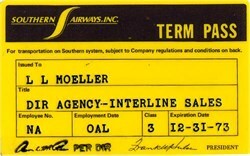 Annual Pass issued in 1973 to L. L. Moeller, Director of Agency and Interline Sales for National Airlines. The pass has the printed signature of the company's President, Frank Hulse. Southern Airways was a regional airline operating in the United States from its founding by Frank Hulse in 1949 until 1979 when it was folded into Republic Airlines, which on 1 October 1986 became part of Northwest Airlines. Southern Airways began its life operating Douglas DC-3 aircraft on a route system which covered the south-central portion of the U.S. By 1968, Southern's route system extended from its most northerly stop at the Bristol-Kingsport-Johnson City (Tri-Cities regional) airport in Tennessee southward to its most southerly points at New Orleans and Jacksonville, Florida. The westward boundaries of Southern's route system were marked by Baton Rouge and Monroe, Louisiana. Routes extended eastward to the Atlantic Ocean at Myrtle Beach and Charleston, South Carolina. Southern began acquiring 40-passenger Martin 4-0-4 piston airliners secondhand from Eastern Air Lines in 1961, and its final DC-3 retired in 1967. The airline began acquiring 65-75 passenger Douglas DC-9-10 fanjets in 1967 and 85-95 passenger DC-9-30 fanjets in 1969. Some of these were bought new from the manufacturer. Southern did not operate turboprop aircraft as a transition from propeller equipment to pure jets, as many other airlines did. Instead, like Trans World Airlines, it moved directly from piston-engined equipment to jets. However, by the time of the merger with North Central, Southern had replaced its Martins with a small fleet of 19-passenger Fairchild Metro II turboprop commuter airliners. By 1971, Southern was operating flights into New York City and Chicago and as far south as Orlando and Miami. Because U.S. government regulation of airline routes prohibited Southern from operating flights from New York or Washington, D.C. nonstop to Atlanta, an unusual route developed which provided multiple daily flights from New York and Washington nonstop to Columbus, Georgia, then on to Dothan, Alabama; Mobile, Alabama; Eglin Air Force Base, Florida; and/or Gulfport/Biloxi, Mississippi. Southern remained a regional airline in character, and flights with up to five or six stops were frequently found in their published schedules. Columbus, Georgia to Washington, DC. and New York/Newark. Meridian, Mississippi to Birmingham, Alabama; Columbus, Mississippi; and Laurel/Hattiesburg, Mississippi. Tuscaloosa, Alabama to Atlanta, Georgia and Columbus, Mississippi. Muscle Shoals/Florence, Alabama to Memphis, Tennessee and Huntsville/Decatur, Alabama. Greenville, Mississippi to Memphis, Tennessee and Monroe, Louisiana. Columbia, South Carolina to Greenville/Spartanburg and Charleston, South Carolina. Albany, Georgia to Atlanta, Georgia; Valdosta, Georgia; Dothan, Alabama; and Columbus, Georgia. None of these routes are served with full-size jet aircraft today, few of these routes are served at all, and some of these airports no longer have any scheduled airline services whatsoever. By the mid-1970s, Southern's route system had expanded significantly to include St. Louis, Detroit, Ft. Lauderdale and Grand Cayman, which would be Southern's only international destination. Southern Airways billed itself as the "Route of the Aristocrats." It was famous for its promotional shot glasses: for a time, a differently designed shot glass was issued each year. Original Southern shot glasses are valued by collectors of the airline's memorabilia. By the late 1970s, Southern Airways had begun to experience difficulties. Two fatal accidents blighted the airline's otherwise excellent safety record. Improved highways and an increasing willingness among airline passengers to drive to airports farther away for more convenient flights made many of Southern's routes obsolete. With dramatic increases in the price of jet fuel in the 1970s, operation of many of Southern's routes was no longer cost-effective. On 1 August 1979, Southern merged with North Central Airlines to form Republic Airlines and the "Route of the Aristocrats" came to an end.